According to Ayurveda, the ancient healing tradition of India, your immune system is most supported and nourished by two things: love and honesty. Ojas refers to both the gross and subtle essence of immunity. Healthy ojas makes you cheerful, loving, compassionate, generous and resistant to both physical disease and more subtle negative influences. It gives you strength, stamina, equanimity and clarity. Healthy ojas means that we have enough “juice” to deal with life’s natural ups and downs. 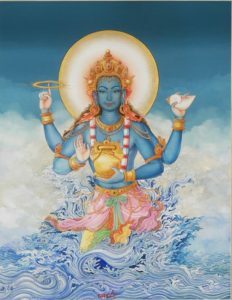 When ojas is depleted, we can feel chronically malnourished, dry, disappointed, bitter, under attack, defensive, territorial, miserly, fragile and unable to handle or digest circumstances. We can tire or give up after only moderate effort. Our ability to see things through or “surf” life’s difficulties is impaired. We are also more likely to fall ill.
Every morning now, we wake to reports of new cruelties being perpetrated by the U.S. government on its own people and the people of the world. We wake to a barrage of lies and the dismantling of basic human rights and protections at the hands of the same people who are supposed to protect us. We wake to experience the impunity and seeming glee with which our government is relinquishing any responsibility for caring for our planet: our home and the home of our children and those to come. Intellect fails to grasp the scale of the ignorance and cruel-heartedness that has been unleashed and empowered. But our hearts, our bodies and all aspects of our immune system are directly registering this grand-scale assault on honesty and love. What can we do to protect our ojas and thereby sustain contact with our sense of our own and Nature’s innate goodness? How can we support our capacity to persist in opposing tyranny and not succumb to grief and fatalism? Here are a few guidelines. Following them can enhance and conserve your ojas. And you’ll be helping the resistance, too! 1. Practice total honesty with yourself and others. This is the number one step you can take to support your immunity. 2. Follow impulses to be generous. Generosity nourishes ojas and is also the fruit of enjoying healthy ojas. 3. Cook food with loving attention to its ability to nourish you. Buy the healthiest, most visually appealing food you can find, and let yourself take the time to experience all of its qualites as you cook and eat. If you don’t cook, learn! 4. Eat with people you love as frequently as possible. 5. Make your own ghee and enjoy some every day. Ghee is a living symbol of ojas. 6. Try to drink natural, high-quality water. If you can find untreated spring water, that is best. But at least drink filtered water. Berkey filters make the sweetest, most natural-tasting water in my experience. 7. Be in nourishing relationships with others. It’s bad enough that we have to be in such an unnourishing relationship with our government. Don’t make it worse by hanging onto toxic, or energy-draining personal and work relationships. 8. Upgrade the beauty and freshness of your home and work environments. Now is a great time to hang out in spaces that remind your body, energy and mind to relax and enjoy life’s bounty. 9. Take media breaks. Too much media unbalances mental fire (tejas) and this disrupts the production of ojas. 10. Spend more time in Nature, and treat Nature as a sumptuous meal you are digesting with all of your senses. Conserving and building ojas is something we want to commit to for a lifetime. But it is especially important now. We need to be able to maintain our energy and deepen our access to open-heartedness. By expressing and following the wisdom of the heart, we will make our way.